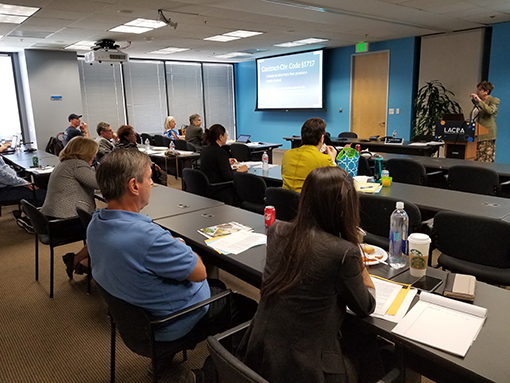 Marilyn Klinger, a partner at Sedgwick LLP, provided great information about Maze or Labyrinth: All the Different Ways to Recover Attorney's Fees in Construction Litigation. Thanks, Marilyn! California, which led the way in medical marijuana issues, has recently joined a handful of states that permit recreational marijuana. Given that marijuana is still federally illegal, California attorneys are faced with a growing number of ethical questions about whether to represent cannabis-related clients and how to effectively do so while abiding by the California Rules of Professional Conduct. Conditions on a project endorsed by a governmental agency do not constitute mitigation where the record shows those conditions were not the basis for the agency's conclusion that the project qualified for a categorical exemption from California Environmental Quality Act. Government Code Sec. 65700(a) leaves the nature of the general plan amendment process entirely to the discretion of charter cities. A charter city's specific plan was not void since charter cities are exempt from the Government Code's requirement for consistency between specific development plans and the city's general plan. The Clean Water Act allows the Environmental Protection Agency to require National Pollution Discharge Elimination permits for industrial storm water discharges, but the EPA has not exercised this authority. Since the CWA places no legal requirements on industrial storm water discharges, there can be no inconsistent requirements with the Resource Conservation and Recovery Act. A landowner does not have a duty to assist invitees in crossing a public street when the landowner does no more than site and maintain a parking lot that requires invitees to cross the street to access the landowner's premises, so long as the street's dangers are not obscured or magnified by some condition of the landowner's premises or by some action taken by the landowner. In denying a motion to quash an unlawful detainer summons, the trial court may not restrict a defendant's responsive pleading to an answer. Substantial evidence supports the conclusion that the type of physical deterioration embodied in the term "urban decay" is not a reasonably foreseeable consequence of withdrawing judicial functions from the downtown area of a small town and relocating them to a new building that will not siphon business from downtown.